Shortly after Tim Collins, the 70-year-old investment banker and founder of electric vehicle racing startup KleenSpeed, won a time trial race at the Laguna Seca Raceway, he told me in an interview that KleenSpeed “plans to get into the car business.” Well, this week, the EV startup, which uses the racetrack to test EV tech, has come a step closer to that goal and has launched a$15,000 electric vehicle power system that can be used to convert internal combustion engine cars into EVs. 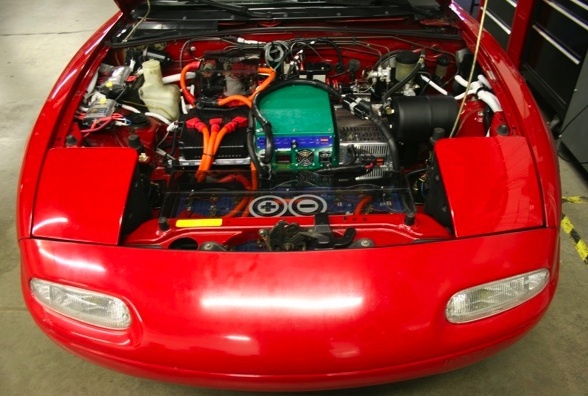 The so-called “KleenSpeed Lite EV Power System” includes a motor, lithium-ion batteries with up to 100-mile range, battery and motor control systems, and the necessary cables, converters and connectors to complete the conversion. Customers can take the system and make an EV out of a car, truck or utility vehicle with a weight of under 2,500 pounds. KleenSpeed has already used the technology to convert a Miata into what it calls a Eiata — or an electric Miata.